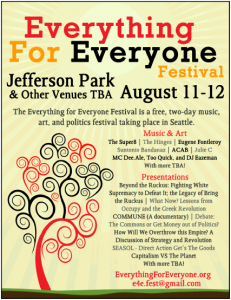 The Everything For Everyone Festival, a free two-day music, art, and politics festival, is coming to Beacon Hill’s Jefferson Park on Saturday, August 11 from 11 a.m. to 7 p.m. The event will include music and art, as well as political and educational panels and workshops. On Sunday, August 12, the event will move to Seattle First Baptist Church on First Hill for a closing plenary session, followed by a film screening and dance party at Highline Bar on Capitol Hill. The schedule is here, and the program is here. Performers will include The Super8, The Hinges, Eugene Fontleroy, Suntonio Bandanaz, ACAB, Julie C, MC Dee.Ale, Too Quick, and DJ Eazeman (see bios of the performers here). There are many presentation and workshop topics, including Free U: Abolish Education to Liberate Creation, Religion and Revolution, People’s Community Medics, Occupied Media: Communicating the Rebellion, Fork in the Road: The Path to Revolution through Investigation, and more.